I’ve been working on designing and coding web projects like our newly launched Applications section, and a revamp of the Forums. It’s been awesome thinking of the different ways to show the amazing things our users have been making with the Form 1+, as well as participating in the design and production process. More recently I switched to working on a new version of the software used to calibrate the printers on the factory floor. The variety keeps me excited. This past semester at MIT I wrote a python and OpenSCAD program to parametrically generate a maze wrapped around the surface of a cube. 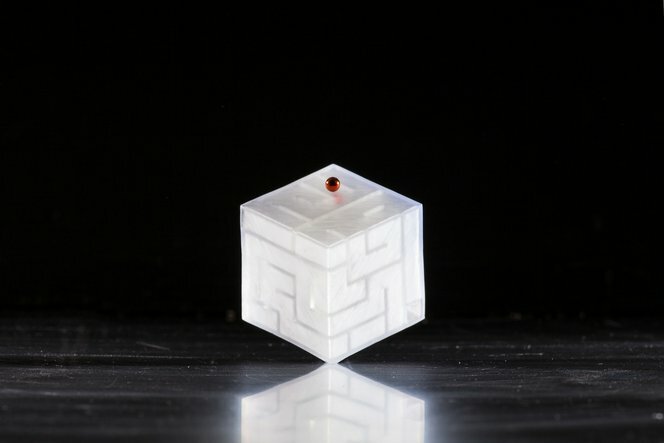 A clear outside layer wraps around the outside with two holes for the start and end points to solve the maze with a small ball. During the semester I had printed it on a Makerbot but could not print the outside wall because I didn’t have a way of making the clear outside wall. With the Form 1+ and clear resin I have been able to print the entire part at once. It’s amazing how clear and finished the part comes out of the printer. I am still playing with different sizes and configurations of the maze.